All work is carried out by very experienced and professional personnel with a large amount of experience in the repair and maintenance of computers in both business and private scenarios. Note if an evaluation fee is charged, if the quote is accepted this fee is included in the final amount. you will not pay twice. We have a Collect and return service. 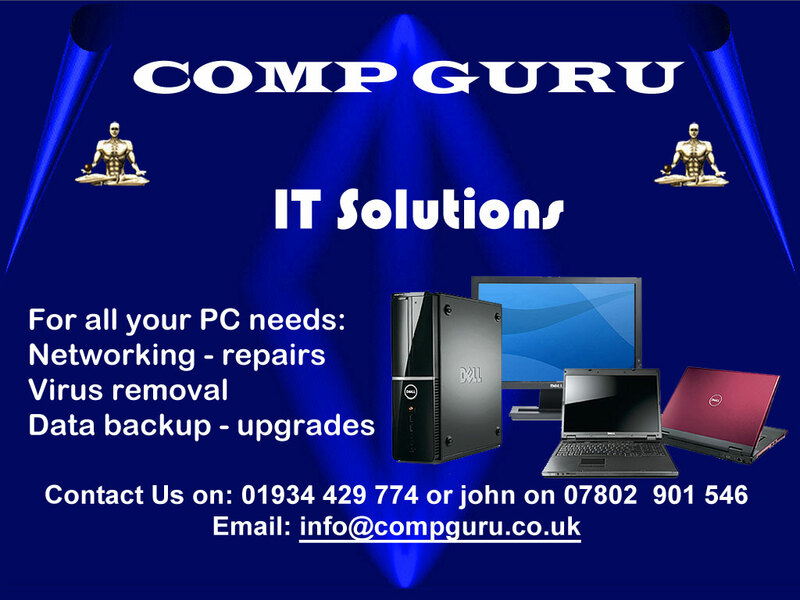 We will collect your PC, carry out any job required and return it to you. Covering all areas within 10 mile radius of Weston-super-mare, Cover outside the 10 miles radius might incur a small surcharge. "Computer expert for up to two hours"
We will come out to your site, home or business and check/fix any problem you wish for a set fee for up to two hours. you have our full undivided attention for two hours. £55 fixed fee. After the two hours £25 per hour is charged. Note most standard jobs will take just over the hour so our fees work out cheaper than someone charging £30 hour. Dead computer or Slow Computer, we will collect your computer, analyse and configure it to run in the fastest and most stable configuration possible. Includes a full virus and trojan check. we will provide a report listing any suggested hardware updates and the order in which they should be obtained. £55. Setting up a new office. We have associated facilities that will completely set up a new office for you including building work, communications, furniture, network wiring and computer setup. We will bring in our associate company who will provide a competitive quote for building work. we can upgrade your computer to a later operating system (including Windows 7 or in the case of a MAC Snow leopard) after backing up your data for safety purposes. £50 if you supply the software, £144 for Windows 7 if the software is provided by us. we can create a personal or business web site for you. Complicated or simple. £15 for evaluation Quote after the investigation However Basic Website creation can be as low as £60. If you want a special tailored computer build, we can create one to your exact specifications. We will advise on the parts, they are then ordered by you, so that the warranty is in your name. We then assemble it, using the preferred operating system. Make them powerful, beautiful or both. £150 assuming you pay for the parts. Note this is so the warranty for the parts has your name on it. Support of workstations and servers for schools and businesses. On a formal or informal basis, We can come in and set to work, wire up, setup up and repair a wide range of networks servers and associated equipment. Including backup. We have a wide range of school and corporate experience. If quick reaction is required give us a try. £20 for evaluation Quote after the investigation. We can setup, checkout and install all modern printers of a wide variety of type including advanced printers like MFD and all in one printers. including networking them. If a Female Engineer is required or for complicated situations a Chaperone, then this can be arranged. We have dealt with people with a variety of physical and mental issues. So if any special arrangements are required we are happy to oblige. If a Female Engineer is required then this can be arranged when required. While we take all reasonable steps to ensure advice given on this web site is safe and works as stated, We cannot take responsibility for any application of the advice given on the web site. It remains the users responsibility that all legal and relevant safely regulations are followed. We further cannot take responsibility for any loss of data that results from the advice given. If the user does not have confidence in their application of the solution given, we strongly advise that a professional in the relevant field is used. The backup of sensitive data is deemed to be the responsibility of the owner of the equipment/computer unless CompGuru ltd has been specifically tasked with the Backup of that data. All equipment should be in safe working condition. If a repair is required to bring it to this point, the engineer should be informed of any fault that compromises safety. The safety of the environment that CompGuru personnel work in is also the responsibility of the owner of the equipment. By requesting work to be carried out you are Deemed to have agreed to these terms. Compguru your local professional computer expert.